Thank you for visiting my website. 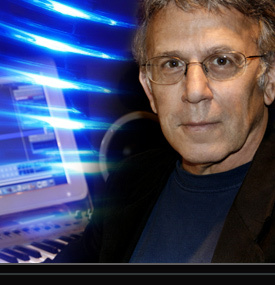 I am a composer for film, television, and interactive entertainment. Feel free to look around my site and listen to samples of my music in various genres. Also check out the video clips which demonstrate how I score to picture. If you have any questions or comments, please get in touch with me through the Contact page. July 11, 2012: The music for my recent NBC Promo, "Who Do You Think You Are?" has been nominated for a Hollywood Media in Music Award (HMMA). The show (and winners) will take place this coming November. May 8, 2012: Three recent NBC Promos feature my music: The Apprentice, the new hit series, Smash, and the even newer series, Who Do You Think You Are? Check the links in the middle-right column to see and hear them. April 18, 2012: The most recent promo for the hit series, "Smash," featured music by yours truly throughout the spot. Uma Thurman starred in the episode entitled "The Movei Star." I will be posting the promo soon. January 29, 2011: Coming Soon - I will be posting new trailers and promos, including The Apprentice (NBC promo), Eyeborgs (feature film), and some brand new trailer music combining orchestra with heavy metal guitar. April 6, 2010: I will be doing an interview and book signing at the upcoming ASCAP Expo in Hollywood. My new book, "Make Your Music Video and Put It Online," is available nationwide and is also in Kindle format on Amazon.com. I will provide more details on the ASCAP Expo book signing as soon as I have them. March 15, 2010: Hmmm, based on the dates of these postings, you'd think I haven't updated my website for a whole year! That would be ridiculous! (Wouldn't it, Mr. Safir?) Well, it takes time to write a book, that's for sure, and I'm happy to announce that my new book, Make Your Music Video and Put It Online is out. It is available at Amazon.com, Barnes & Noble, Borders, Guitar Center, and other booksellers nationwide. Get more info (inlcuding reviews) on the Amazon site. March 31, 2009: I've been asked to write a music book for Cengage Publishing. These are the folks that put out those great books on Logic and other music software. I will reveal more when the time is right. March 22, 2009: I have two articles appearing in The Score, the publication of the Society of Composers and Lyricists. The Technology Curve can be found in the Winter 2008 edition, and The Economy of Focus is the article for Spring 2009. I'm in the process of getting a PDF of each article which will then be posted. Sep. 17, 2008: Although they did not announce any winners at the Hollywood Reporter/Billboard Film & TV Music Conference, apparently I was selected as the winner for my score of “Saints & Sinners” in the video game music category at last year’s event (Nov. 2007). May 29, 2008: Just completed some additional music for the thriller, "Skeletons in the Desert," for lead composer Evan Evans. This, and other cues in the genre, can be found on the Music page under the "Thriller/Suspense" heading. May 19, 2008: Because of a recent project, a new music section has been added to the site, entitled "World-Cinematic." I added the description "cinematic" because the tracks are intended for scoring applications, even though they include authentic, exotic instruments. Check it out under the Music menu. Feb. 8, 2008: Also New: I now have original music cues on ABC Television's "Dance War" as well as "Life with the Kardashians" on E! Television Networks. “It’s a wrap:” I just completed the score to the suspense/thriller, “Dead Zone,” directed by talented newcomer Matthew B. Wolff. You can see some selected clips right here.